Madeleine Mannello focuses her litigation practice on defending clients in a variety of personal injury and property damage matters. Her clients benefit from her extensive civil litigation experience, which includes the defense of state agencies, officials and employees against civil suits—including class actions—involving personal injury, wrongful death, employment discrimination, ADA violations and a variety of other civil rights claims. 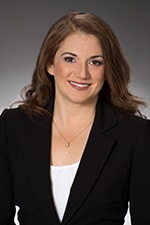 Prior to joining Hinshaw, Madeleine was an Assistant Attorney General in the Civil Litigation Division of the Florida Office of the Attorney General. In addition, she practiced at a firm in Weston, Florida, where she represented individuals in family law cases. Madeleine was also an Assistant State Attorney for the Office of the State Attorney for the Seventeenth Judicial Circuit in Florida.